Besides football, what else is there to do in Canton? In a previous feature on this site I mentioned there is more to Canton Ohio than the Football Hall of Fame. Here is proof. While in that town I had the opportunity to have lunch and tour the Gervasi Vineyard. And simply stated, I was amazed. The address is 1700 55th Street, NE. Gervasi Vineyard is Tuscan inspired and the vineyard itself features 27 varietals with a focus on classical European varieties. It is situated on a 55 acre estate. I tasted a few of the wines, and though I am not a wine expert, I can tell you they were outstanding. The people who own and operate the vineyard treat these grapes with great respect. Their winemaker, Andrew Codispoti, received the very prestigious Winemaker of the Year award in June. 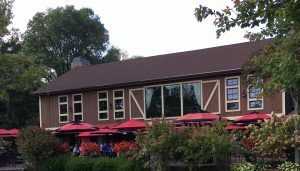 In addition, Gervasi Vineyards recently won 14 Double Gold, Gold and Silver medals at state and international competition. In seven years Gervasi’s wines have grown to 21 labels. It produces over 100,000 bottles annually. They are available online. In August the vineyards along with the Football Hall of Fame partnered to produce a wine featuring the Hall’s logo, It is a Limited Edition Chardonnay. Also on site are six villas with 24 suites. Each villa houses four suites with a large lobby and they face a five acre lake. They are magnificent. If I could I would have hid in one during my tour. Each villa suite has a fireplace, heated towel bars and heated tile floors, huge bathrooms, complimentary wi-fi and plenty more. If you’d prefer, you can also stay in The Farmhouse, a 2200 square foot home resembling an early 1800’s farmhouse. It can sleep 7 to 8 people. Incidentally, the villas are rated as a Four Diamond property. And it was selected as the Best Wine Country Hotel in the U.S. USA Today ranked Gervasi as the number one spot among the top ten winners in the hotel category for wineries across the country. Rates run from $189 to $389 depending on time of year and other factors. And then there’s the restaurants. The Bistro, upscale Italian dining, The Piazza, casual dining, The Crush House & Winery, also casual dining. You can shop in The Marketplace, filled with carefully selected items and Gervasi wines. Reach them at gervasivineyard.com. Before we leave Canton let me mention the Food Tour. This is a four hour walking tour that will take you to various downtown restaurants with a little food and drink in each. Your guide usually is the owner and she is very knowledgeable and energetic. This is an excellent way to learn about some of the restaurants and a bit of Canton history. Reach them at cantonfoodtours.com.